Come get your furry friend fix and come Volunteer with us at the Valley Humane Society! A foster home is a temporary living situation for pets in our program while they are awaiting placement in a permanent home or to move into one of our onsite adoption programs. Foster families provide shelter, food, care and love. The number of animals we can save depends entirely on the number of people who open their homes and hearts to foster them. When you visit our adoptable animals on Petfinder, you can now become a SPONSOR! The money goes toward the animal's adoption fee and any medical care he may need, making it easier for him to find a FOREVER home! ​Check it out by clicking on the "Adoptable Animals" like below! 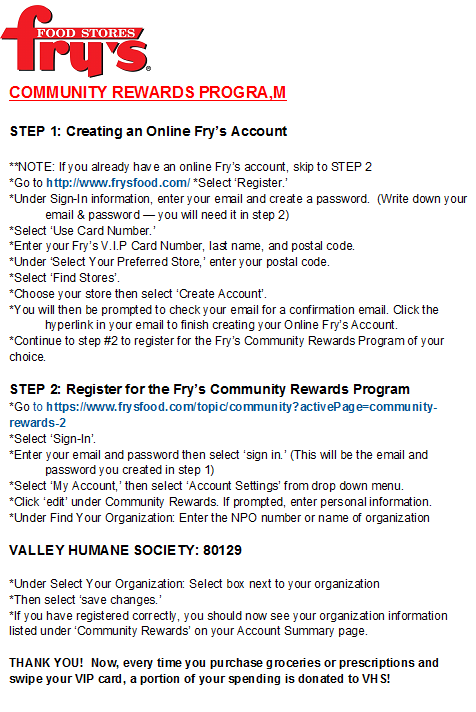 VHS is part of the Fry's Community Awards Program! If you link your VIP Card to us, Fry's will make a donation for every penny you spend. This will not cost you fuel points or other incentives built into your account. Register your card for rewards using our number: 80129. Remember to do this every year! ​Click the link below for step-by-step instructions. Scroll Down to "Pick your own Charitable Organization"
Same Merchandise, Same Prices, but a percentage of you purchases will be donated back to us! A HUGE Shout-Out to Max and Neo Dog Gear! They sent us a giant box of collars, leashes, and other supplies as a donation! Max and Neo are dedicated to serving dog shelters and rescues by donating one for one for every product sold! As of May 2018, they have donated over 133,948 dog leashes, collars and accessories worth over $2,011,720 to over 1700 rescues! Check out their website (https://www.maxandneo.com) and their Facebook page (Max and Neo Dog Gear). ​Help them sell more so they can donate more! PetMeds has made a generous donation to our dogs and cats! Click the link to learn more about them!